A tiny sliver of this luscious gluten-free cake goes a long way. 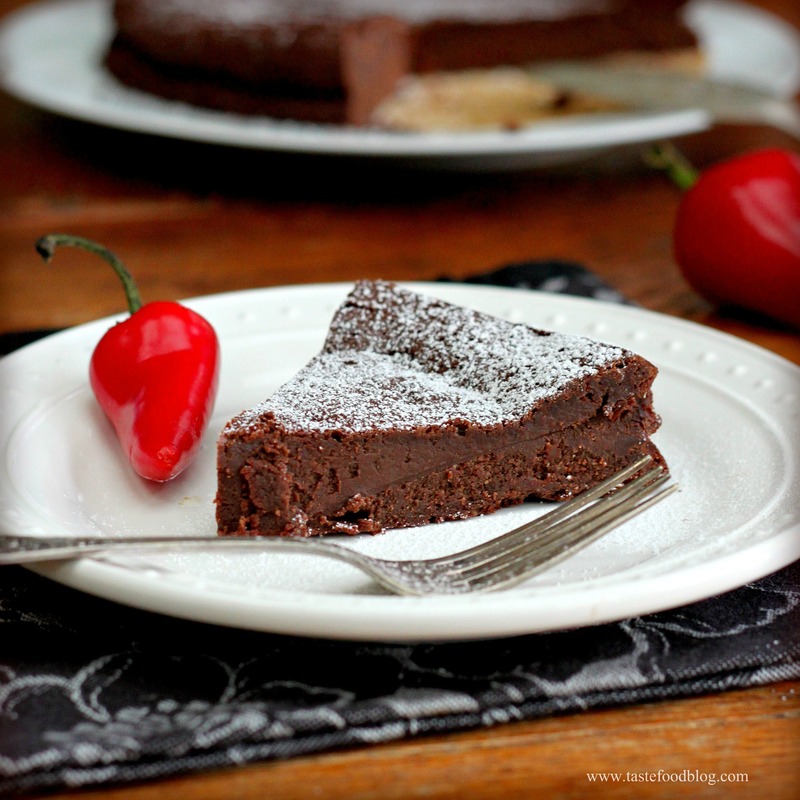 It’s perfect for a Passover dinner or any celebration worthy of an intense chocolatey finale. Choose the best quality dark chocolate you can lay your hands on, because it makes all the difference. The gently sugared cream and naturally sweetened strawberries nicely offset all of the chocolatey goodness which encourages you to eat more – not that any encouragement is necessary. Heat the oven to 350°F (180 C). Butter a 9-inch diameter springform pan. Line the bottom with parchment paper and butter the parchment. Sprinkle with unsweetened cocoa powder and tap out the excess. Wrap the outside of the pan with foil to prevent leakage. Combine the chocolate and butter in a double boiler or heat-proof bowl placed over a saucepan of barely simmering water. Stir frequently until the chocolate is melted and smooth. Remove from heat. Beat the egg yolks and 6 tablespoons sugar in the bowl of an electric mixer fitted with a whisk attachment until light and thick, about 3 minutes. Transfer the eggs to a large bowl. Thoroughly clean and dry mixing bowl and whisk attachment. Fold the melted chocolate into the egg yolks. Stir in the vanilla. In the clean mixing bowl, beat the egg whites until soft peaks form. Gradually add the remaining 6 tablespoons sugar until medium-firm peaks form. Fold the whites into the chocolate in 3 additions. Pour into the prepared pan. Bake until the top of the cake is slightly puffed and cracked and a knife inserted into center comes out with moist crumbs, 40 to 50 minutes. Transfer to a wire rack and cool completely in the pan. While the cake is cooling, prepare the glaze. Heat the cream and syrup in a small saucepan just until it reaches a simmer. Remove from heat. Add the chocolate and whisk until smooth. Gently press down on the top of the cake to even its thickness. Remove the pan side and invert the cake onto a plate. Remove and discard the parchment. Pour the glaze over the center of the cake. Spread the glaze over the top and down the sides of the cake, using a flat icing spatula to smooth the glaze. Sprinkle with grated chocolate. Chill in the refrigerator until firm, about 10 minutes. Serve at room temperature with whipped cream and fresh strawberries. It’s no secret that I am a huge fan of dark chocolate, and my friends know it. So when I was recently gifted a box of Swiss chocolate from a longtime friend visiting from Geneva, I did the natural thing: I hid it. I could say it was under the guise of recipe research, but who would I be kidding? My preferred chocolate is very dark with little bling. However, with that said, I do from time to time like to mess with my chocolate. My favorite embellishments are almonds, sea salt and chili. None of these additions detract from the richness of the chocolate, nor do they add any cloying sweetness. Rather they seem to amplify the deep chocolate flavor, while tickling the taste buds and hitting a few always-welcome umami notes. So for a little Valentines Day present, I have for you not one but two recipes with a version of spiced up chocolate. After all, there’s nothing wrong with spicing anything up around Valentine’s Day. 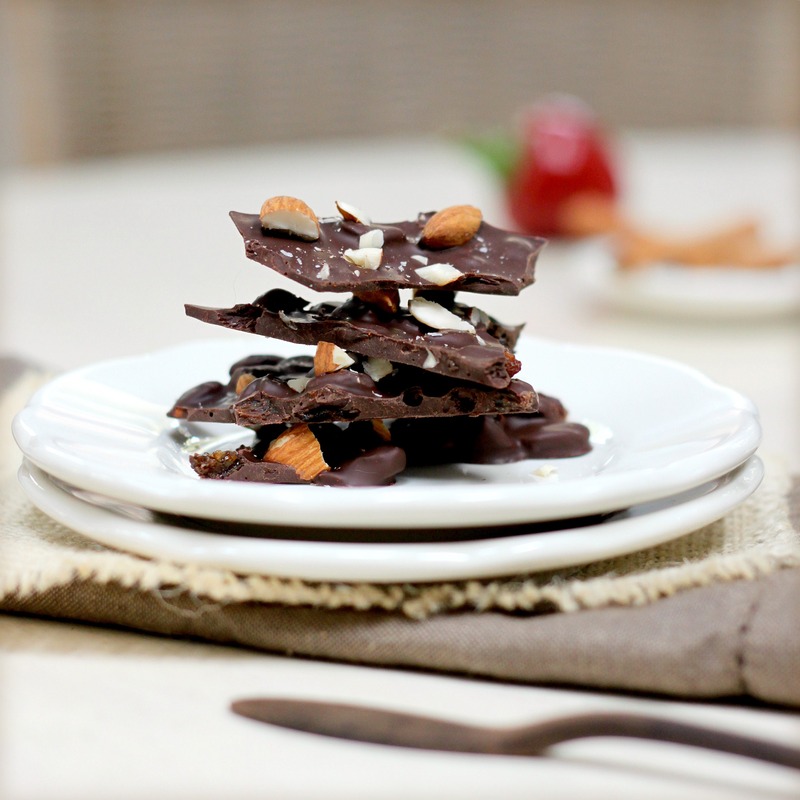 The first recipe is for Aztec Chocolate Bark which you can find in a column I wrote for The Weiser Kitchen on Swiss chocolate (of course). 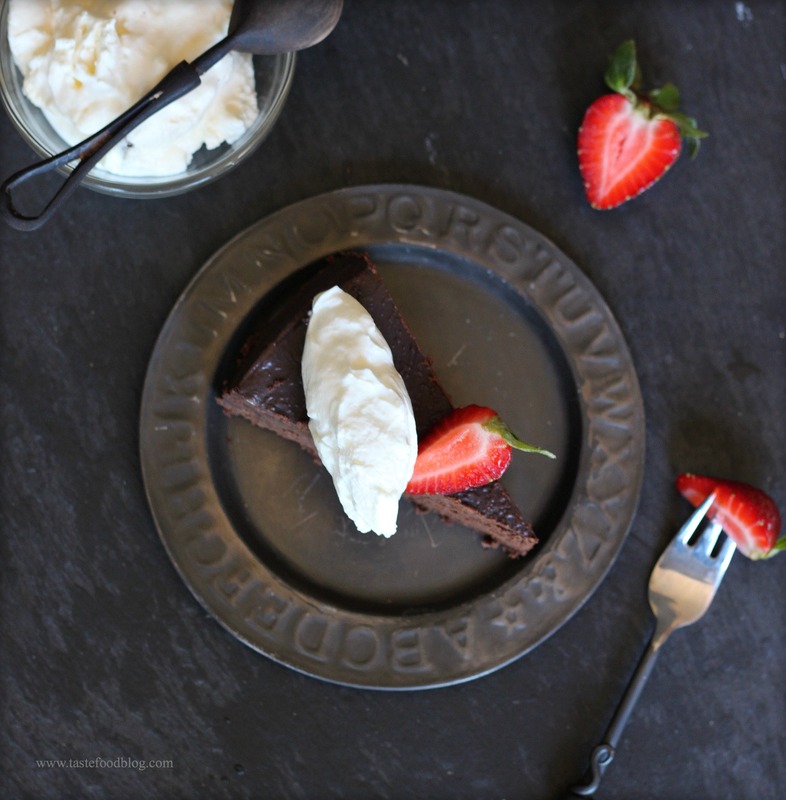 And since love and chocolate go hand in hand with abundance (or at least they should), I will share with you below this recipe for Chile Spiced Flourless Chocolate Cake. Happy Valentine’s Day! Preheat the oven to 350°F. Butter a 9-inch springform pan. Line the bottom of the pan with parchment paper and butter the parchment. Melt the butter and chocolate in a double boiler over barely simmering water making sure that the bottom of the bowl does not come in contact with the water, stirring occasionally. Whisk the eggs and sugar together in a large bowl. Add the melted chocolate, vanilla, chili powder, cinnamon, salt and cayenne. Stir to combine. Pour into the prepared springform. Bake until the cake is set and the top begins to crack, about 40 minutes. (The center will still be moist.) Cool completely on a rack. Remove the side of the pan and transfer to a serving plate. (Cake may be made up to one day in advance. Cover and refrigerate.) Serve sprinkled with powder sugar before serving. 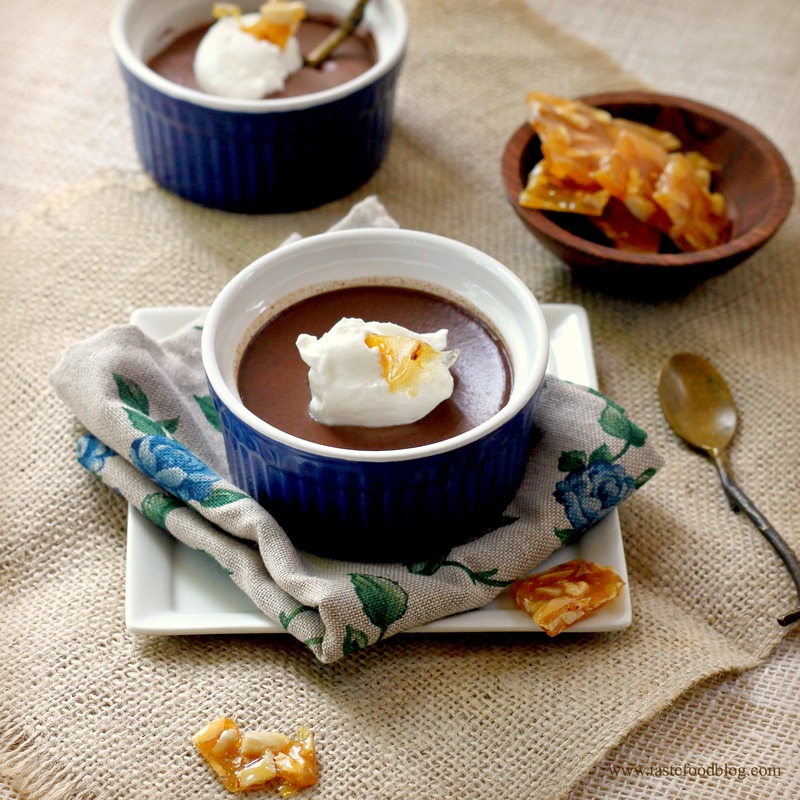 These little vessels of silky rich dark chocolate custard get dressed up with nutty, fragrant hazelnuts. Frangelico liqueur is the secret ingredient, an Italian noisette (hazelnut) flavored liqueur that tastes great straight up or laced in coffee or over ice cream. It’s also a great addition to an affogato. This recipe will make 6 generous servings for diehard chocoholics. If the portions are too intense, divide among espresso cups for the perfect sweet after dinner touch of chocolate. For best results, use high quality dark (70%) chocolate. And if you can’t find frangelico but still feel nutty, then substitute amaretto. Begin this recipe 1 to 2 days in advance of serving. Makes 6 (3/4-cup) ramekins or 12 espresso cups. Preheat oven to 325 F. (170 C.) Heat the cream and milk in a saucepan over medium heat until it reaches a simmer. Remove from heat and whisk in the chocolate until melted and smooth. Whisk the egg yolks and sugar together in a large bowl until blended. Add the cream in a steady stream, whisking to combine. Whisk in Frangelico. Strain through a fine meshed sieve into another bowl and cool for 5 minutes. Pour into ramekins or espresso cups. Place the ramekins in a baking pan. Fill the pan with boiling water half way up the ramekins. Cover ramekins with foil and transfer to oven. Bake until set, but still a little wobbly when jiggled, about 55 minutes for ramekins and 45 minutes for espresso cups. Remove from water bath and remove foil. Cool completely on a wire rack. Cover and refrigerate overnight. Beat the cream in the bowl of an electric mixer until traces of the whisk appear. Add sugar and Frangelico. Continue to beat until peaks form. Heat the sugar in a heavy small saucepen over medium heat until sugar melts, stirring occasionally with a wooden spoon. Continue to cook, stirring constantly, until sugar turns amber in color. Add the nuts and sea salt and stir quickly to coat. Pour onto a baking sheet lined with parchment and spread into a thin layer.. Do not touch with your fingers. Cool completely. Break into small pieces. To serve, spoon a dollop of cream over the center of each ramekin. Top with chards or finely chopped praline. Sometimes when life hands you lemons….you make chocolate. In this case, deeply dark, intensely rich Swiss chocolate in the form of a cookie. While I can’t speak for you, I can do with some chocolate therapy right now, and this cookie is just the antidote. 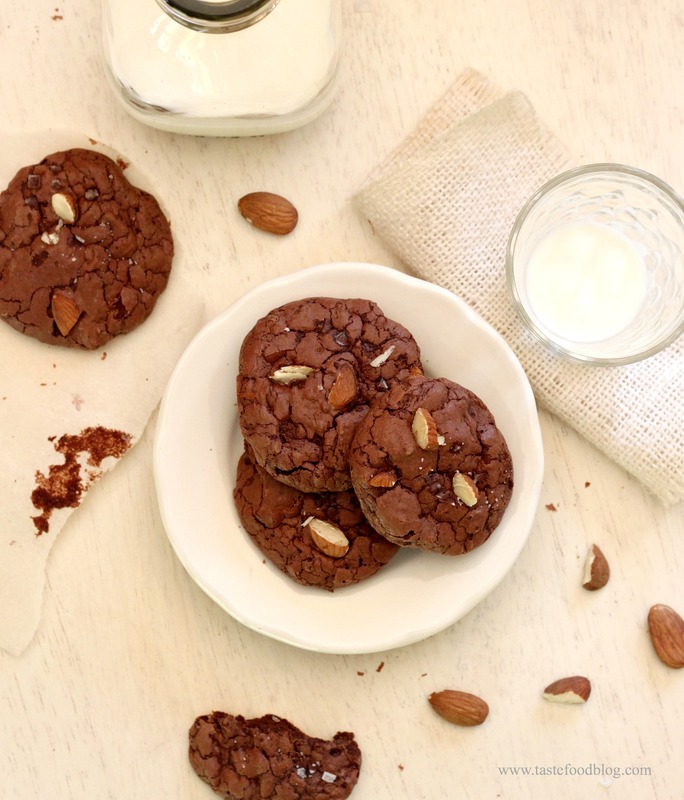 In fact, it’s hard to find a more chocolate-y cookie. Nearly 1 pound of melted dark chocolate is reconfigured in an airy yet rich cookie with a crackly exterior and gooey center, all thanks to 4 billowy eggs and just a little bit of flour. The lemonade will have to wait for another day. My chocolate mantra applies to this recipe: Choose the best quality dark (70-72%) chocolate you can lay your hands on. Makes approximately 30 (2-inch) cookies. Melt chocolate and butter in the top of a double boiler over barely simmering water, stirring until smooth. Remove from heat. Beat eggs and sugar in the bowl of an electric mixer until thick and very pale in color, 3 to 4 minutes. Add chocolate and vanilla. Mix to combine. Whisk flour, baking powder and salt in a small bowl. Add to chocolate and stir to combine without overmixing. Cover and refrigerate 30 minutes. Heat oven to 325° F (170° C). Line baking sheet with parchment paper. Drop heaping tablespoons of the cookie batter onto parchment, leaving 2 inches between cookies. 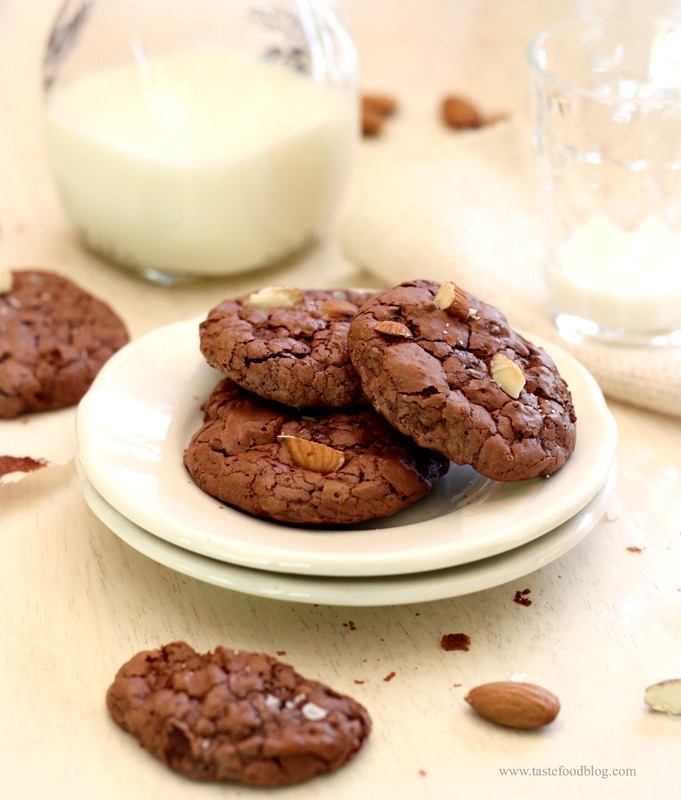 Sprinkle each cookie with a few almonds and a pinch of sea salt flakes. Bake in oven until tops crack and cookies are set, 13 to 15 minutes. Remove from oven and transfer parchment to wire racks to cool. Allow cookies to cool completely before removing from parchment (they will stick if they are still warm). 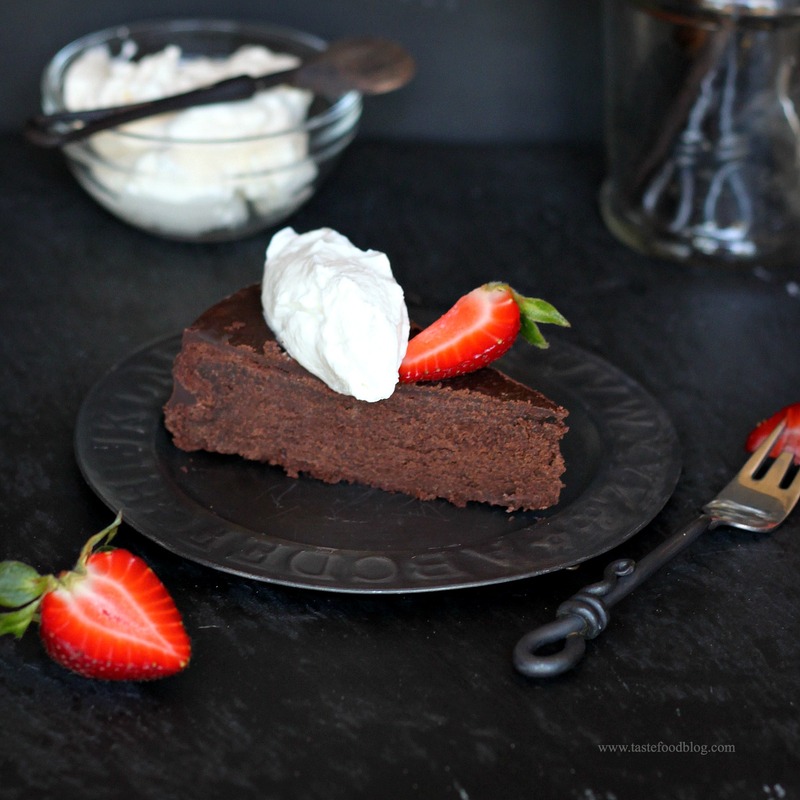 Or, more precisely, a wedge of luscious silky-rich chocolate cake with billows of airy cream and sun-kissed strawberries. Parse it as you may, emphasize it as you must, this is one dessert that will please chocoholics and fruity fiends alike. I made this cake for a crowd last weekend, and it easily served 12 with a few slices to spare. A tiny sliver goes a long way – or maybe not, depending on your inclination. Choose the best quality dark chocolate you can lay your hands on, because it makes all the difference. The gently sugared cream and naturally sweetened strawberries perfectly round out and balance the chocolatey richness, which, naturally, helps you eat more. There was, I promise, a bounty of strawberries when I served this cake, but the berry eaters in the group devoured them before I could use the harvest as a photo prop. Heat oven to 350° F (180 C). Butter a 9-inch diameter springform pan. Line the bottom with parchment paper. Butter the parchment. Sprinkle with unsweetened cocoa powder and tap out the excess. Wrap the outside of the pan with foil to prevent leakage. 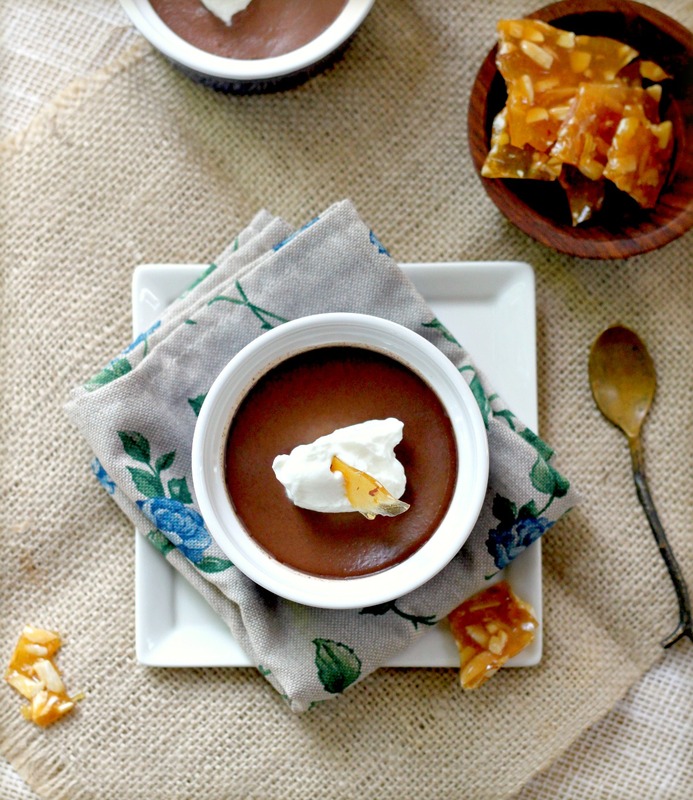 Combine chocolate and butter in a double boiler or heat-proof bowl placed over a saucepan of simmering water. Stir frequently until melted and smooth. Remove from heat. Beat egg yolks and 6 tablespoons sugar in the bowl of an electric mixer fitted with a whisk attachment until light and thick, about 3 minutes. Transfer eggs to a large bowl; thoroughly clean and dry mixing bowl and whisk attachment. Fold the melted chocolate into the egg yolks. Stir in the vanilla. In the clean mixing bowl, beat egg whites until soft peaks form. Gradually add remaining 6 tablespoons sugar until medium-firm peaks form. Fold the whites into the chocolate in 3 additions. Pour into prepared pan. Bake until top is slightly puffed and cracked and a knife inserted into center comes out with moist crumbs, 40 to 50 minutes. Cool cake completely in pan on a wire rack. While the cake is cooling, prepare the glaze. Heat cream and syrup in a small saucepan just until it begins to simmer. Remove from heat. Add chocolate and whisk until smooth. Gently press down on the top of the cake to even thickness. Remove pan side. Invert cake onto a plate. Remove and discard parchment. Pour the glaze over the center of the cake. Spread the glaze over the top and down the sides of the cake, using a flat icing spatula to smooth the glaze. Sprinkle with grated chocolate. Chill in refrigerator until firm, about 10 minutes. Serve at room temperature with whipped cream and fresh strawberries. The bane of my childhood candy experience was a Mounds Bar. I just didn’t get it. I would bite into the promising chocolate nugget, which would immediately give way to a chewy, shredded, nutty interior, that in, my opinion, had no rightful place in a chocolate bar. It was clearly the texture that I did not like. I was mystified by my friends who bought super-sized packages of Almond Joys to scarf down when we were at the movies. Every halloween when my brothers and I would pile our loot in the middle of the kitchen table, gloating and eyeing trade-ups, my chocolate covered coconut bars were the first to offer up with no regrets. Sadly, my brothers were not so keen on coconut either, so the negotiating could get ugly. As a parent, it baffled me that my children loved coconut. But as chief cookie baker, I stepped up to the plate and used coconut more and more freely in bars, cakes, and cookies. And, you know what? I, too, developed a fondness for this tropical “nut”, appreciating its flaky fresh and nutty interruption in a sea of sugar. I guess you could say I grew up. I eat coconut now, unforced, and prefer it paired with dark chocolate. 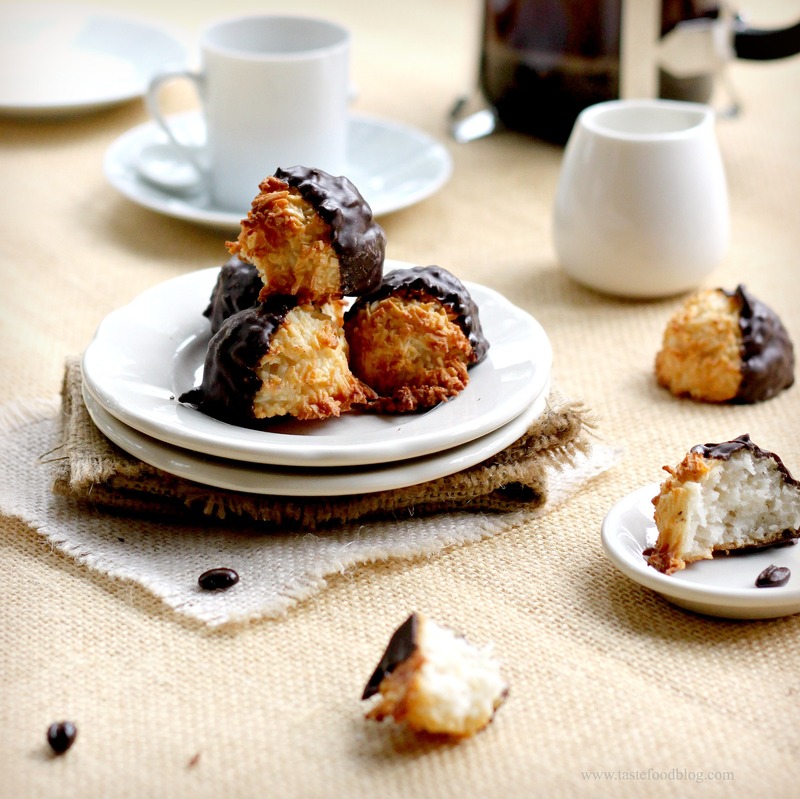 Sometimes I make macaroons, a jumble of coconut bound together with egg white and condensed milk. Yes, the milk is icky-sweet, but it seems to yield the best juicy soft interior, which is what prevents dryness and distinguishes a great macaroon. I’ve followed a recipe from Ina Garten from time to time, but switch out some of the sweetened coconut with unsweetened, which I find reduces excessiveness cloyness. Oh, and I always dunk them in dark chocolate, of course – which has a magnificent grounding effect on, well, everything. Heat the oven to 350°F (180° C). Line a baking sheet with parchment paper. Combine the milk, coconut, and vanilla in a large bowl and stir to blend. Beat the egg whites and salt in the bowl of an electric mixer until soft peaks form and then fold into the coconut. Drop heaping tablespoon-sized mounds of coconut on the baking sheet. Bake until golden brown, about 25 minutes. Remove and cool completely on a rack. Dip one half of each macaroon in the melted chocolate and transfer to a board or platter lined with parchment. Refrigerate until set.